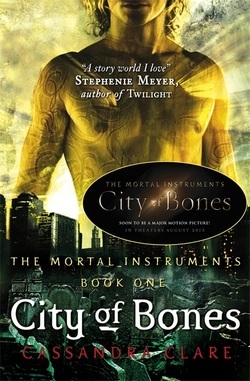 The Mortal Instruments: City of Bones is the first book in an enduring, captivating series revolving around the supernatural exploits of warriors known as Shadowhunters. Set in modern day New York City, author Cassandra Clare creates an alluring tale about a young teenage girl named Clarissa Fray. Clarissa--referred to in the novel as Clary--must learn to deal with the new world of demons that opens up to her while also coming to terms with her own past. Seeing things that no one else can, Clary plunges deeper and deeper into the world of the Shadowhunters. Understandably, descent is a the primary theme intended for the Mortal Instruments series. Clare's books have received worldwide renown and the Mortal Instruments brand is on its way to super stardom, vying to join the likes of literary superpowers such as Harry Potter and Twilight. Clare certainly has the writing chops to join those ranks. These books are some of the most exciting young adult novels in the market and would make a brilliant addition to any course curriculum. This web-quest focuses on providing readers a look into the book that started it all, City of Bones. Students and teachers will find resources to deepen their knowledge on the Shadowhunter world and mythos. This web-quest hopes to be a valuable pre-reading asset, helping students to gain contextual knowledge. In addition, this web-quest is a love letter to the Mortal Instruments series and it's continued success.